We can advise and help you with devices so that you can make technology work for you – it all depends on what best suits your needs. Once you have the technology that will best meets your needs, the Blind Foundation team can, if needed, train you in how to use it. That means you will be able to keep in contact with people and manage daily living, study or work activities. You can learn with any combination of one-on-one or group sessions with a Blind Foundation staff member, online resources and peer support. If you are studying or working, you might need particular equipment, or modifications to existing equipment or a workplace environment, to suit your needs. You may need some training. A Blind Foundation Employment Consultant can work with you around the process for this. Technology training and support is free for all Blind Foundation adult clients. School-age students may be eligible. This can be considered on a case-by-case basis when support is required outside the school curriculum. For some courses you will need prior skills, e.g. 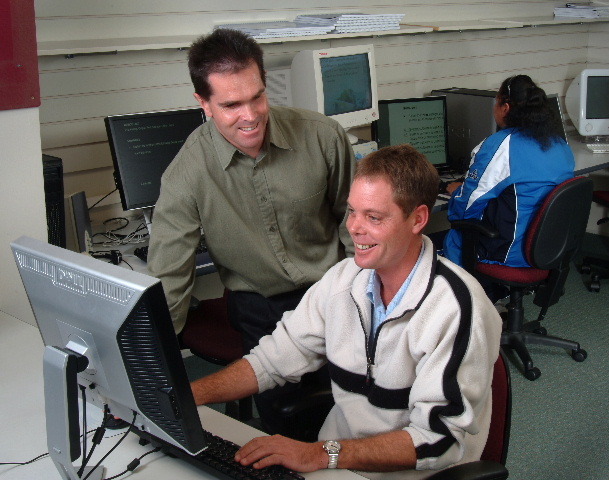 a computer course will require keyboarding skills. One on one training can be provided to help you develop these skills. If you’re looking to do an advanced course, then you will need to complete a basic one first if you don’t already have the required entry skills. There may be a small cost for some training materials. To find out how the Blind Foundation can help you with your technology needs call 0800 24 33 33 or email generalenquiries@blindfoundation.org.nz If you want quick advice, you can also use the Blind Foundation Adaptive Technology Help Desk – you’ll find all the details for that below.